Corsair makes a lot of PC gaming products. Top notch memory, solid power supplies, it’s K70 and other gaming keyboards are practically legendary in the eyes of PC gamers. Gaming mice, though? Corsair isn’t exactly the first name that comes to mind, but there’s more going on behind the scenes than you think. 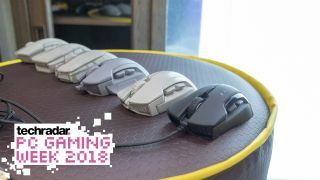 Gaming mice have actually been a recent focal point for Corsair, according to Corsair’s Product Manager of Keyboards and Mice, Michal Nowicki, and it all started with the Glaive RGB, which the company released in May 2017. “[At the time,] we were missing something with an ultra-comfortable shape and that was highly customizable,” Nowicki recalls. “Because these are sort of elements of our DNA, we think that customizability, durability, and that comfort to play for hours and hours at a time is something that we're known for. Nowicki remembers the Glaive RGB being a real step-up challenge for him and his brand new Human Interface Device (HID) peripheral group to come up with a perfectly comfortable mouse shape. At the very start of the design process, Nowicki’s team will come up with five or so models cut out of foam in a process similar to CNC machining. From there, the Corsair design group will narrow down their initial models to two or three concepts to be 3D printed. From there the HID peripheral group can start putting together devices with more detail, playing around with different grips and even semi-functional items that allow them to start judging lighting performance. As with its partnership with Cherry on keyboards, Corsair works closely with PixArt to supply the sensors for its mice. But Corsair isn’t simply just getting these mouse sensors in, slotting them into the bottom of their mice and calling it a day. Rather, Nowicki tells us that Corsair adds features like DPI resolution adjustment to allow you to fine-tune your sensitivity. The gaming hardware maker also tunes its sensors to a variety of surfaces in addition to its own soft and hard mousepads. More recently, Corsair also introduced their first wireless gaming mouse, in the form of the Dark Core RGB, that posed new challenges. Just like the K63 Wireless, Nowicki wanted a wireless peripheral that worked as well as wired, which meant a lot of controlled testing in an anechoic chamber before thoroughly evaluating their performance in a real life environment. “At home, you have all this equipment there; routers and all these wireless devices, you have streaming stuff all over your apartment,” Nowicki explains. “There's so much noise, so much interference. That was a challenge, for us to make sure that the Dark Core RGB is doing well. Nowicki says we can expect a lot more from Corsair’s gaming mice in the near future – and we don’t just mean quantity, but also quality.